Located in the Tampa Bay area of Florida, the Suncoast Scale Model Boat Club is a organization for those who have radio controlled operational scale model boats. We welcome all experienced in this hobby as well as those new and in need of help getting started in scale model boat building. The Suncoast Scale Model Boat Club (SSMBC) was the first club dedicated to operational scale model boats in the Tampa Bay area. For more information on the history of the SSMBC go to the "About Us" page on this site. Also, check out our introduction video [click here]. This site was updated on April 9,, 2019. All photos and text - copyrighted 2019 by the Suncoast Scale Model Boat Club. Disclosure: The SSMBC and this site does not have any financial ties to any company, political affiliantion nor any other substity and has no gains from these and any other person(s). The SSMBC and this site is purely for the enjoyment of its members and others in this hobby. 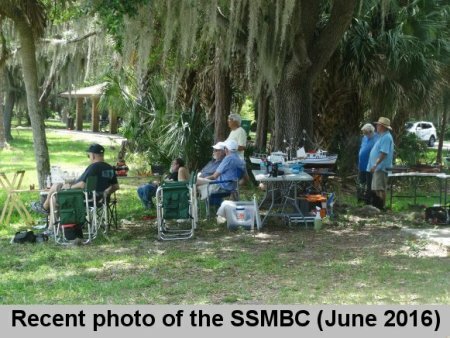 The SSMBC is easy to join, free, and no club officers. Just fun - fun - fun - until your better half takes your boat away! Video of the SSMBC display at the 2019 IPMS Convention in Largo, Florida. If anyone does not get our email (usually two every two weeks) please send an email or call. Info is on the Contacts page. Buying/Selling scale model boats (assembled and kits) has been added on the Info & Reading page. Check this out if you need information on model selling and buying. Our meet on March 17 had a good showing of members, good number of boats as well. (The April 21 meet was cancelled due to it being Easter Sunday.) Two new members ("prospective" from the last meet) came with their boats. The weather was great. See the photos under Gallery 61 (Photos and Videos page). Submit ideas for upcoming meet days so we can turn that into "special" meets. Some ideas... Springer towboat contest; tugs, tows, and barges; timed course navigation, etc. Suncoast Scale Model Boat Club - we meet (weather permitting) on the 1st and 3rd (and optional 5th if there is one that month) Sundays of each month. We may not meet on certain Sundays due to holidays. We usually start setting up at about 11:00 AM and continue as long as there is interest and good weather. This could well run on to mid-afternoon. Most meets run to about 1 to 1:30 PM. The SSMBC currently meet's at the small pond (first one on the left as you come in) at Lake Seminole Park in mid-Pinellas County, 10015 Park Blvd. Seminole, Florida. Park. This roughly 310 foot diameter pond has been popular with model R/C boaters for well over 40 years. Primary area: at shelter #1. The covered shelter has multiple picnic tables in it. However, it is first come - first served. Any member that gets their early and no one else is there, please hold it for the club. Alternate area: If shelter #1 is occupied, we will use the grass area by the dock. Most members bring a table and chairs just in case. This area is right next to the ramp for the dock as facing the water. There is shade under the trees. The floating dock is about 9 feet by 37 feet making it spacious. It has multiple step-downs around the water sides that allow members to stand only inches above the water's surface for launching and retrieving boats. As there are plenty of trees around the water, they disrupt the wind somewhat making the pond calmer than many other areas. Park at shelters #1 (or # 2 if filled) parking lots. Each parking lot is about 120 feet away from the water. Rest rooms are close as well. We have a portable docking system (about 40 linear feet of docks) that we set up in cooler months and special dates. We can set these up next to the floating dock on the south side of the pond. This gives us a nice "port" for the boats to operate in. We have the "SSMBC Members' Wanted, Trade, For Sale, Free - Classifieds Page" (also listed under the links page). We are all about radio controlled scale model boats. Most members have enough skills to build virtually all kits and often build from scratch. New members are welcome, even if you need help to get you up to speed. We are not about not-to-scale sailboats (pleasure/competition) nor speedboats (hydros, etc. ).